Possible Housing Site - What Do You Think? 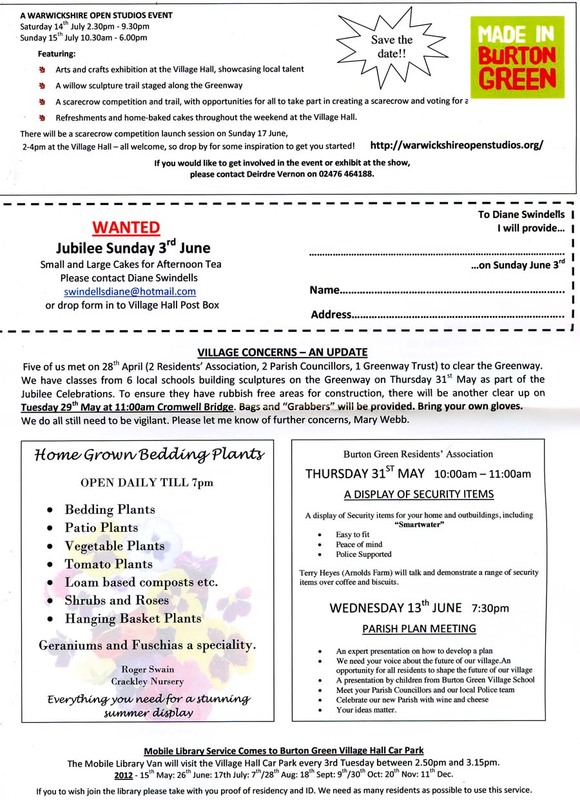 The information on this page was originally circulated to residents by Dr Paul Thornton. This page also contains comments and clarification about Dr Thornton's letter, provided by Councillors George Illingworth and David Skinner (Westwood, Coventry). "Burton Green has been added to the villages which it is proposed will find space for between 30 and 80 homes on brownfield and green belt land..."
This is a map that was included in a link originally sent out by Dr Thornton. The shaded areas show sites described as 'potentially suitable urban edge sites'. George Illingworth has pointed out that this site at Westwood is NOT included in Warwick District Council's latest Preferred Options Map. George Illingworth's clarification and explanation are reproduced further down this page. 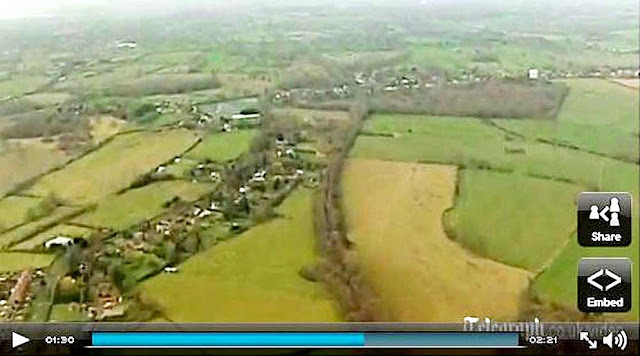 ...Burton Green has been added to the villages which it is proposed will find space for between 30 and 80 homes on brownfield and green belt land; the wording will also be changed for the plan to “make no provision” for high speed rail, rather than oppose it; and it emerged many had misunderstood ‘safeguarding’ pockets of green belt land as meaning that it would be protected from future development rather than being set aside for it." "There will be a consultation period, which starts on 1st June and runs for 8 weeks through 27th July. The only housing development proposed close to the Coventry border is a small amount of growth (between 30 and 80 houses) at Burton Green. The exact location of this has not been decided and is something that the District Council will be working on with the Parish Council. The sites shown on the plan you have attached were put forward in the Strategic Housing Land Availability Assessment and were assessed by us [WDC] as being potentially suitable – though of course that does not mean they will all be subject to development. I can confirm that the agreed Preferred Options does not include proposals for development on the site at Westwood Heath. If you, or any residents, wish to comment on the Preferred Options you would be welcome to do so. All the details will be available on our website [WDC] from Friday 1st June." "By coincidence, I have today sat in on the inaugural meeting of the new [Coventry] Council Scrutiny Board 6, where Housing and HSR2 were both debated. My primary interest is to safeguard Westwood Ward residents, and I shall send a personal comment about the new proposals to Mr Barber as soon as I can. I shall bear in mind the 17,000 Coventry residences owned by Whitefriars Housing Group, many of them in my Ward. Council planning officers have just told me; "I can confirm that we will formally respond [to WDC] before the deadline of 27th July". This will be the official professional officers response. The final decision will be taken by Warwick District Council, not Coventry. I am aware of Dr Thornton's excellent research and have read his comments with great interest." "The area marked on the map above is NOT the area being suggested by the District Council. It is an area put forward by developers and considered in the assessment, but rejected for good reasons so that it does not form one of the preferred options to be consulted upon. It did feature in the supporting working papers and I know that I can rely on most people in Burton Green to object most strongly to it. That Green Belt around Coventry must remain intact. The nearest preferred site to Burton Green is at Thickthorn in Kenilworth. What is proposed for Burton Green is indeed just what is being suggested in the comment above. A small amount of housing (30 rather than 50, I would have thought, over many years) within the village envelope allowed by adjusting the Green Belt within the village. This is what a number of residents preferred in the recent survey. The exact ideas and location will indeed be discussed with the Parish Council as David Skinner says.You can rest assured that I have been fighting the threat of development in the Green Belt for years." Thank you for your information on WDC plans for future building. I have passed this on to as many residents as possible in my Ward. B The open space between my Ward and Kenilworth should remain green. "That Green Belt around Coventry must remain intact. The nearest preferred site to Burton Green is at Thickthorn in Kenilworth". I entirely agree, and would remind everyone that Cromwell Lane is already busy and Bockendon Avenue/Crackley Lane potentially dangerous. A large lorry, with the driver speaking on his mobile telephone, nearly forced me off that road recently. If you ever wish to speak to me, I shall be happy to hear from you. The Art on the Greenway Exhibition opens at 12 noon and runs until 5.00 on Sunday, while afternoon teas will be available from 2.00 - 4.30. 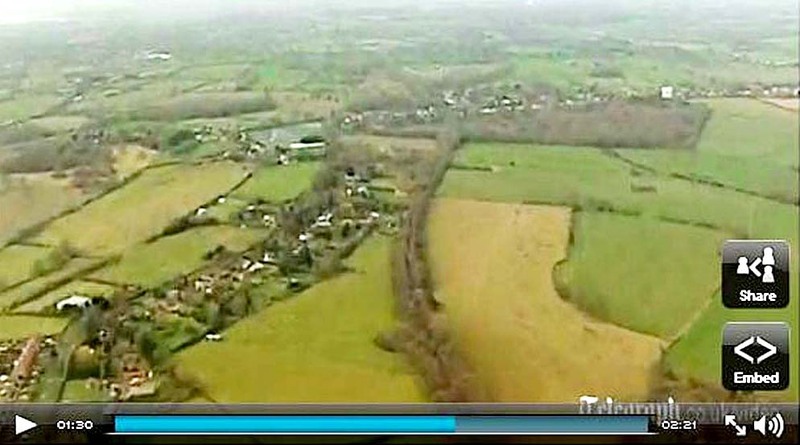 The Daily Telegraph has posted a video showing the entire route of HS2, filmed from a helicopter flying from London to Birmingham, along the path of the proposed route. You can see that this frame is at 1 minute, 30 seconds into the video. Red Lane is the road running up from the lower left corner, and the Water Tower is clearly visible as a white blob at the upper right. 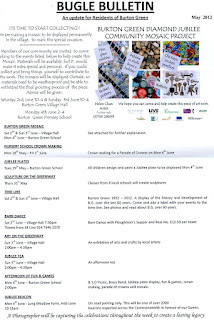 Annual Council meeting of Burton Green Parish Council, which will be held at 7.00pm on Thursday, 10 May 2012, at Burton Green Primary School, Hob Lane, Burton Green. To decide whether to appoint a Vice Chairman. If so decided, to elect a Vice Chairman. To consider the minutes of the meeting held on 10 April 2012. (a) To consider whether any Committees should be established. (b) To appoint members to any Committees which are established. To consider the draft Standing Orders and Financial Regulations as attached. To confirm the Council’s continued membership of the West Midlands Association of Local Council’s and Information Commissioners Office. To receive a verbal report from the Acting Clerk regarding land and assets including buildings and office equipment owned by the Council. To review and confirmation of arrangements for insurance cover in respect of all insured risks. To consider ordering appropriate publications and stationery for the Council. 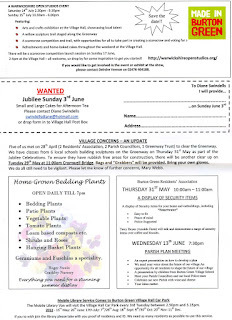 To discuss an official Burton Green Parish Council web site. 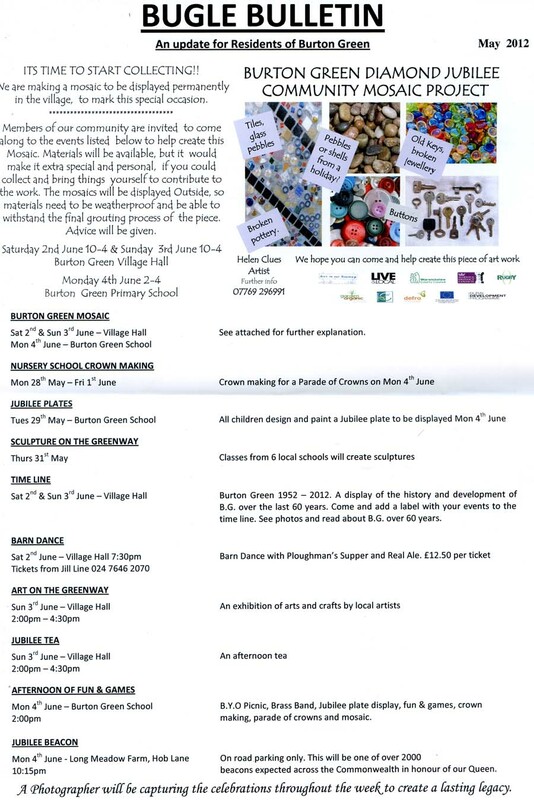 To confirm that from May 2013 the Council meets at Burton Green Village Hall on the third Monday of each month. To consider a report from Councillor Taylor.